The Senate voted on the DARK Act today and it did not pass, with only 44 votes in favor of it. "It’s an important victory for Democracy over the attempt of corporate interests to keep Americans in the dark about the foods they buy and feed their families," says Andrew Kimbrell, Executive Director of the Center for Food Safety. Vermont can now go ahead and label GMOs on July 1, and other states will surely follow. And legislators will push for the two bills that require labeling. Now that it will have to comply with Vermont’s law, General Mills says it will label foods across the US, because it doesn’t make sense to do it in just one state. Others are sure to follow. 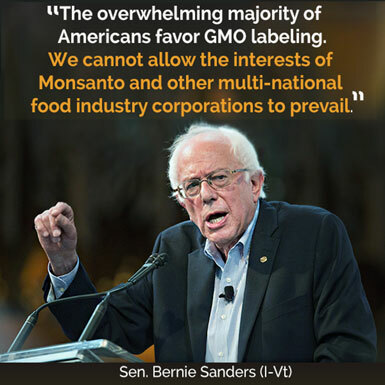 Senator Bernie Sanders, a co-sponsor of the mandatory GMO labeling bill says: "I am pleased that Congress stood up to the demands of Monsanto and other multinational food industry corporations and rejected this outrageous bill. Today’s vote was a victory for the American people over corporate interests. "Sen. Roberts’ legislation violates the will of the people of Vermont and the United States who overwhelmingly believe that genetically modified food should be labeled. Republicans like to talk about states’ rights, but now they are attempting to preempt the laws of Vermont and other states that seek to label GMOs. "All over this country, people are becoming more conscious about the food they eat and the food they serve their kids. When parents go to the store and purchase food for their children, they have a right to know what they are feeding them. GMO labeling exists in 64 other countries. There is no reason it can’t exist here." Hillary Clinton supports GMOs. When she was Secretary of State, they were promoted around the world. This week, Senator Roberts (R-KS) brought Monsanto’s dream bill, the DARK Act, to the Senate floor. 1. It prohibits states from requiring GMO labels on food and nullifies Vermont’s first-in-the-country law, which goes into effect this July. 2. It allows foods that contain GMOs to be labeled "natural." 3. Most egregious, it directs the USDA to convince Americans that GMOs are safe and have many benefits! The USDA would have a create a consumer education platform that lauds biotechnology. SEC. 294. INFORMATION FOR CONSUMERS. (a) EDUCATION – The Secretary, in coordination with other Federal agencies as appropriate, shall provide science-based information, including any information on the environmental, nutritional, economic, and humanitarian benefits of agricultural biotechnology, through education, outreach, and promotion to address consumer acceptance of agricultural biotechnology. Recently passed out of the Senate Committee on Agriculture, where 14 of the 20 members voted Yes – all of which received large donations from big food and the biotech industries. All Republicans voted in favor, along with three Democrats: Amy Klobuchar (D-MN), Joe Donnelly (D-IN), and Heidi Heitkamp (D-ND). Last year, the bill sailed through the House. Sponsors Reps. Mike Pompeo (R-KS) and GK Butterfield (D-NC) are the biggest recipients of campaign contributions from special interests. Those who voted in favor in the House received triple the money of those who voted against it – about $108,000 per member. The Grocery Manufacturers Association – the trade association for Big Food, has been leading the effort to kill labeling, followed by PepsiCo and Monsanto, according to Open Secrets. A bill to require GMO labels has also been introduced in the Senate by Jeff Merkley (D-OR), Patrick Leahy (D-VT), Jon Tester (D-MT) and Dianne Feinstein (D-CA): the Biotechnology Food Labeling and Uniformity Act. Under the bill, the Food and Drug Administration (FDA) would develop a symbol – in consultation with food manufacturers – that would clearly disclose the presence of GMOs on packaging. More than 600 organizations support labels, including farming and fishing groups and food companies, representing tens of millions of people. Polls show that over 90% of Americans want mandatory labels. GMO labels are mandatory in 64 countries including Japan, China, Russia, Australia and the European Union. Read our article, Two-Thirds of EU Countries Opt Out of GMOs, While Monsanto Is Exposed. 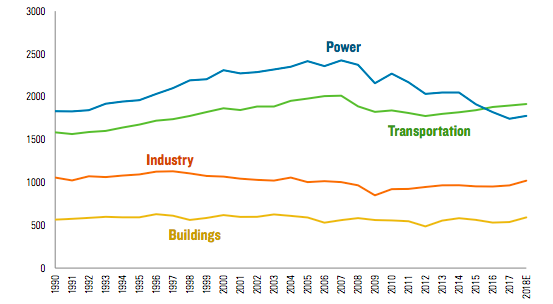 Next Next post: World Emissions Flat, Second Year In A Row!